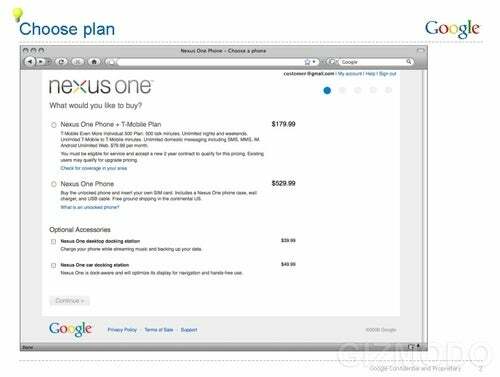 A day after Google confirmed its Android media event next week pricing details and the terms of sale were leaked for its highly anticipated Nexus One smartphone. Gizmodo broke the story with Nexus One site screenshots (Click on Gizmodo image to the left to enlarge) that show the phone on sale for two prices: a subsidized T-Mobile edition for $180 or an unsubsidized version for $530. Choosing the lower-priced option will rope you into a 2-year commitment with T-Mobile and relegate you into the "Even More" plan, which includes 500 minutes of talk and unlimited text and Web for roughly $80 a month. If you have a pre-existing single-line plan with T-Mobile that's cheaper than Even More: tough. But if you do have a cheaper plan, you might consider spending the $530 up front and possibly saving money over the course of time. Google and T-Mobile also invented a way to get at the throats of early plan-cancellers. "If you cancel your plan before 120 days, you have to pay the subsidy difference between what you paid and the unsubsidized price, so $350 in this case. Or you can return the phone to Google. You also authorize them to charge this directly to your credit card," wrote Gizmodo. In a way it's a solid deterrent against people who think they're clever enough to get an unsubsidized phone for $180, but still sounds a bit harsh. Language in the TOS implies shipping availability outside of the U.S.
Engadget snagged a PDF copy of the TOS, if you want to read it in its entirety. At $530, an unlocked Nexus One sounds a little steep, but the high price tag shouldn't affect early adopters and Google fanatics who have been salivating at the prospect of the company's first smartphone.